My issues continue, and then some. Say a farewell to my cellphone, which spent a good 30 minutes in the pocket of my swimsuit today while I was juggling the kids in the pool today. At least the kids survived. It’s getting near the point where I just need to call this a vacation, but I’m going to continue to try to post when I can. For your pregame enjoyment, here’s Ramona Shelburne’s great feature on Albuquerque’s John Lindsey for ESPNLosAngeles.com. You know, it might have been enough of a silver lining just to be celebrate Hiroki Kuroda’s first hit of the season, coming in his 46th at-bat. But we were five outs away from something even more transcendent – the cathartic thrill of celebrating a Kuroda no-hitter – before Shane Victorino’s one-out single to right field in the top of the eighth inning of the Dodgers’ game against the Phillies tonight. Part of the thrill would have been feeling that the no-hitter could hardly have happened to a nicer Dodger. Kuroda walked two, hit a batter, struck out six and raised his season batting average to .022 before the first H went up against him. He struck out a seventh batter, and then Hong-Chih Kuo relieved him with two out in the eighth, inducing a first-pitch force-out from Mike Sweeney. 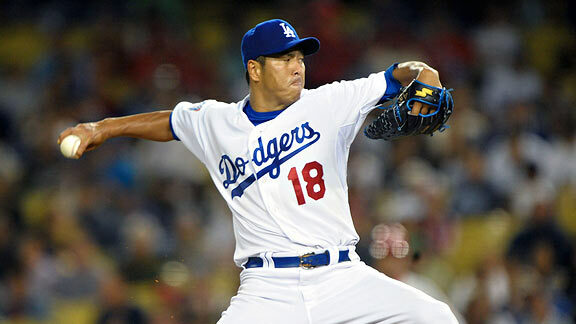 Kuo then pitched a perfect ninth to wrap up the combined one-hitter, a 3-0 Dodger victory. “The funny thing is, decisions will be made, games will be won or lost, we’ll all think we know more than we did – and then we’ll still be blindsided by something new, as Dodger fans always have been,” I wrote two days ago. Kuroda almost singlehandedly proved that. And although he fell short, to quote from the movie “Diner,” it’s a smile. I’ve had a lot of thoughts about events of the past couple of days, and I’m having trouble juggling them amid the time constraints I’m facing this week. With tonight’s game about to start, let me get the quickest and most meaningless of them out of the way. This is Clayton Kershaw’s team now. It’s his team in the way that the San Francisco Giants became Tim Lincecum’s team, partly through lack of other options and partly because of how precociously good he is (although with Lincecum’s recent struggles, that might no longer apply). Kershaw is the Dodgers’ pinnacle, in the present and the future, in a way that Matt Kemp and Russell Martin in their own ways haven’t been able to sustain, and that Rafael Furcal hasn’t been able to stay healthy for. And only people on the other side of the Mississippi would think this was Joe Torre’s team. Maybe this might have been Andre Ethier’s team, especially with all the walkoff wonders, but it just hasn’t felt that way. He seems, for all his skills, like a guy lurking in the background. This is no criticism of the skills he has, but he is not the guy that I think opponents fear the most, that represents the best of what the Dodgers have to offer. Clayton Kershaw, 22 years old, is that guy. It might not matter, but it’s pretty amazing that it’s come to him so quickly. How far will he go in that role? Divorce, Dodger-style takes center stage beginning today. Joshua Fisher of Dodger Divorce has a comprehensive preview. Matt Kemp gets a thorough statistical and mechanical analysis, the caliber of which you’ve probably never seen before, from Chad Moriyama of Memories of Kevin Malone. Reduced to being a bit player on a team once again fading, perhaps Manny Ramirez made some say “good riddance” with his one-pitch ejection in his Dodger farewell. For me, the engorged lockdown of Ramirez during the brief and final window the Dodgers had left with him (and perhaps in the playoff race) couldn’t have been more disappointing. No final redemption. Thirteen months ago, Ramirez emerged from salty circumstances to hit a pinch-hit grand slam. Today, no remnants of glory to be found. A memorable chapter closed with Ramirez’s sendoff to the Chicago White Sox, but the ending didn’t exactly make for great television. Next time, let’s have Ramirez wake up next to Suzanne Pleshette or something. Monday brings a stomach-churner of a divorce trial to determine team ownership. I don’t know when, but we will see better days. Manny Ramirez is on the active roster, and he should be playing. The Dodgers have failed to provide a good reason why he isn’t. They say it has nothing to do with his uncertain future; I don’t really care if that’s true or not. He’s a Dodger starting outfielder on the active roster, and that’s what he should be doing until he’s no longer a Dodger. Dodgers 6, Rockies 2: ‘A modest thing,’ and now what? “A modest thing, but thine own,” as Vin Scully might say. A five-run eighth inning, capped by Casey Blake‘s grand slam, propelled the Dodgers to their latest victory Friday and more visions of grand pennant-race comebacks. Los Angeles has caught Colorado, finds the other three National League wild-card contenders considerably more in reach and considerably more mortal in appearance, and only has that nagging Manny Ramirez question to deal with. The Chicago White Sox reportedly claimed Ramirez successfully on waivers, giving the Dodgers three options: let him go for cash savings, trade him for prospects or keep his aching body as part of the playoff bid cavalry. It’s not an easy decision, not the least because this week’s “thine own” represents only about a third of what the Dodgers need for the playoffs. Maybe even less. They need to keep winning to continue the march up the standings, then win some more after that to keep from sliding back down. Not impossible, especially if Rafael Furcal and Vicente Padilla make it back, but still an underdog’s game. So it comes back to what the Dodgers would get from the Pale Hose. If they take the cash or prospects, that’s purely a play for 2011, and other moves with tradeable veterans should be made accordingly. There’s still sense in a seller’s pose, but I imagine competitive juices and dreams of unexpected history are making such deals harder for Ned Colletti to stomach by the day. If nothing else, “thine own” will give Colletti more backbone in considering parting with Ramirez. And so we move into the next 24-48 hours of grand precipice. The funny thing is, decisions will be made, games will be won or lost, we’ll all think we know more than we did – and then we’ll still be blindsided by something new, as Dodger fans always have been. No daytime posting from me today, so keep an eye on ESPNLosAngeles.com for any potential news. In the meantime, this makes for a good day for you to jump into this year’s edition of Tangotiger’s 2010 Scouting Report – By the Fans, For the Fans. For more information, read this. Jeffrey Phelps/AP Casey Blake gets a post-homer high-five from James Loney. Cynicism be damned, the Dodgers are still playing meaningful games. With Manny Ramirez’s future still uncertain, Los Angeles defeated Milwaukee, 7-1, to complete a three-game sweep of the Brewers and move within five games of the National League wild-card lead. Though the Dodgers are living on the edge, their next three series are against three of the four teams ahead of them in the wild-card race: Colorado, Philadelphia (swept this week by lowly Houston) and San Francisco. So if you had stopped paying attention or were planning to, you might still be forced to take a peek. (You can keep one eye closed if you want). The Dodgers nursed a 1-0 lead until starter Carlos Monasterios gave up a fourth-inning solo homer to Prince Fielder. The Dodgers got a run back in the top of the fifth, positioning Monasterios to get the win, but the youngster walked opposing pitcher Yovanni Gallardo and then hit his second and third batters of the game to load the bases. Joe Torre, who used three pitchers for a batter apiece in Wednesday’s ninth inning, continued on his “You think you’ve seen me manage? You haven’t begun to see me manage” crusade. He brought back Ronald Belisario (pitching in his third straight game) and George Sherrill to each get an out and extract the Dodgers from the bases-loaded, none-out jam. After that, the offense took over. Casey Blake hit a two-run homer in the sixth, and then a one-out walk to Kenley Jansen (who walked one and struck out four in two innings) keyed a three-run seventh inning that broke the game open. And the bullpen not only didn’t blow the lead, it allowed no hits, as Octavio Dotel and Jeff Weaver wrapped up the combined two-hitter. By comparison, Scott Podsednik, starting in left field while Ramirez took his scheduled day-game powder, had three hits by himself, as did Rod Barajas’ understudy Brad Ausmus. Ryan Theriot added two knocks. The two teams combined to strike out 23 batters, 11 by Dodger pitchers, 12 by Milwaukee. Gallardo, who entered the game with a 3.28 ERA, struck out 10 but was charged with six runs in 6 1/3 innings. Dodgers at Brewers, 11:10 a.m. I would expect we’ll see a healthy dose of Jeff Weaver and Kenley Jansen at some point today, but everyone but Ronald Belisario is expected to be rested enough to pitch today. Manny Ramirez is on pinch-hit detail. On a night that the Dodgers’ National League West wild-card rivals each took leads after being down by nine runs, the Dodgers had a more modest rally task: a two-run deficit. But you don’t get points for difficulty in baseball – just for wins. Los Angeles scored three in the fifth and one in the sixth, then held on for a 5-4 victory over Milwaukee. The Dodgers closed within 5 1/2 games of the wild-card co-leaders Philadelphia (which took a loss to Houston with Roy Halladay on the mound) and San Francisco (which trailed 10-1, led 11-10 and lost 12-11 in 12 innings). Manny Ramirez had two doubles and two walks on waiver day, driving in one run and scoring another (as well as being thrown out at home when inexplicably sent around the bases by Larry Bowa). He might have made himself more attractive to other teams; he might have made himself more attractive to the Dodgers. Bottom line: Tonight might at least stop this from being a complete Ramirez giveaway with nothing in return. 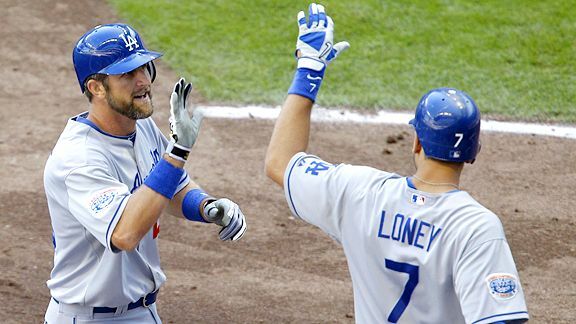 Andre Ethier had a solo homer, and James Loney, Casey Blake and Ryan Theriot each had two hits. The latter three and Ramirez combined for six doubles. Hiroki Kuroda allowed four runs on seven baserunners in seven innings, striking out seven, before Jonathan Broxton pitched a 1-2-3 eighth. Joe Torre played matchups to the hilt in the ninth inning, using Ronald Belsiario, George Sherrill and Octavio Dotel to each get an out. It was suspenseful and a bit harrowing (the last two outs required running plays by Jamey Carroll and Matt Kemp), but it succeeded. Dotel has a sparkly necklace, almost like something a kid might wear in the crowd during a fireworks show. Maybe it looks different on the field, but I’m surprised he’s allowed to pitch with it. Sandy, what’s the difference between the way you manage your life and the way anybody else would manage his? –I don’t do anything different. I do the things that most people do. There are times when I feel like I have an obligation not to do certain things because I’m preparing myself to pitch. But other than that my life is about as normal as I can keep it. Yes, but you have this reputation for being awfully hard on yourself. –Maybe I am. I know sometimes people’ll say, “Well, you’ve done everything possible, what’re you gonna do next? You can’t pitch a better ball game.” And I say to myself, “Well, why not? Why can’t I do more, why can’t I do a better job?” There’s nothing to stop me — except the hitters. You can always try to pitch a better ball game, the best you possibly can. Sandy, I’ve seen you after you’ve pitched and you sit at your locker and you look like World War II. At this stage of your career isn’t there any tendency on your part to jake it a little, not to put out quite so much? –I can’t. I can’t. Sometimes you get enough runs and you try to take it easy and all of a sudden you’re in trouble. Yes, but you go out there and work like a guy who’s expecting to be cut right after the game. The disappointing Dodgers’ worst 34-game stretch this season has been 13-21. That’s the exact record that the Los Angeles Sparks rode into the WNBA playoffs that start tonight. Gregg Found and Matt Willis of ESPN.comdelve into Hiroki Kuroda’s near-historic 0-for-40 season at the plate. Did you know Takashi Saito can’t see a catcher giving signs with his fingers at night? Mark Bowman of MLB.com has details (via Hardball Talk). Jim Thome, who had four singles in 17 plate appearances as a Dodger a year ago, is having one of the best age-39 seasons in baseball history, according to Aaron Gleeman of Hardball Talk. Check out friend of Dodger Thoughts BHsportsguy’s Dodger-related homage to Allan Malamud at True Blue L.A.
Colorado rallied from a 10-1 deficit today to defeat Atlanta, 12-10, sweeping the Braves in a three-game series. And San Francisco rallied from a 10-1 deficit as well — the Giants were tied with the Reds in the ninth, 11-11. Adam Davis/Icon SMI Manny Ramirez at bat for the first time after coming off the disabled list Saturday. Manny Ramirez has been placed on waivers and could soon be on the move from the Dodgers, if (1) he goes unclaimed on waivers and is traded or (2) if he is claimed on waivers and the Dodgers work out a deal with that team. Ramirez can be moved anytime before the season is over, but the deal must be done by Aug. 31 if he is to have postseason eligibility with that team. For all his faults, Ramirez — at least the good, healthy Ramirez — has truly been missed by the Dodgers, as Tony Jackson of ESPNLosAngeles.com wrote earlier this week. Maybe it’s correlation that the team slumped offensively once Ramirez stopped being a regular part of the lineup at the end of June — maybe Ramirez would have been just another piece of a miserable pie — but let’s just say that it would have been nice to see what the parallel universe with a healthy Ramirez in the lineup would have looked like. His hitless return since Saturday hasn’t helped matters, but I’ve been wondering if Ramirez’s prolonged absence this summer redeemed any of his value in the eyes of his detractors, similar to how the Dodgers’ recent struggles at catcher (pre-Rod Barajas) might have compelled people to look at the bright side of Russell Martin. Probably not, I suppose. Ramirez, who was an unqualified success from his July 2008 acquisition until his May 2009 suspension, has become a fan punching bag (one of many) in the past year. It didn’t take long for the zeitgeist to zip from Mannywood to Anyone but Manny. Juan Pierre’s brief hot streak that spring certainly fueled some of that transition, along with general disgust toward Ramirez’s transgression. When Ramirez came back last summer, there was the Bobbleslam, but that was a last bit of fireworks in a fizzling of popular opinion after he turned out not to be the magical hitter he had been. The depth of the souring on Manny became even more apparent when people actually got angry after Ramirez stated what couldn’t have been more obvious — that after his Dodgers contract expired this season, he would be taking his aging body elsewhere. It was no more a statement of disloyalty than a second-term president acknowledging the 22nd amendment — and of course, no one’s raising any loyalty issues against the Dodgers for now possibly unloading him to another team — but it somehow became another bullet in the chamber against Ramirez’s reputation. Thereafter, Ramirez stopped talking to the press, which was of no moment except that it ticked off the press. In any event, the season began, and it became clear that Ramirez was a different sort of hitter than he had been — still an effective hitter, but one for whom the long ball was an increasing rarity. Joe Torre rested him to protect his legs, but it didn’t help, not enough, anyway. Ramirez was a top that had been spinning a long time, and was wobbling, and finally, as summer came, fell down. And like him or not, the Dodgers needed that top to keep spinning. The lingering issue is whether Ramirez essentially took himself out of the game — whether he bailed on the team. I don’t happen to think that’s the case. I think Ramirez had plenty of personal incentive to get himself back in the lineup — with each passing week on the disabled list, his value in 2011 declined, and it’s not as if Ramirez is wholly lacking in professional pride. The guy’s legs have stopped working. Maybe Ramirez will announce his retirement at the end of the season, and people will go back and determine that he had mentally checked out months earlier. I doubt it. Ramirez is, for all his eccentricities, an athlete, one who was working out in Arizona and not just because he enjoys life amid the cacti. It might be days or even weeks too early to talk about Ramirez’s Dodgers legacy — I’m not gonna have much left to say when his time is actually up — but unless destiny exercises its prerogative to change its mind on this meandering season, we’re close to being able to render a final judgment. Ramirez was unbelievable in 2008 for the Dodgers, a freight train at the plate. That he couldn’t live up to that performance in the next two years wasn’t surprising, but it doesn’t take away from what he did. And for whatever crimes he did, he did the time. I, for one, choose not to throw back the Dodgers’ 2008 and 2009 National League Championship Series appearances. 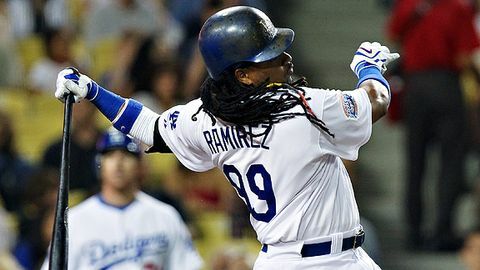 Ramirez was a vital part of the Los Angeles Dodgers the past 2 1/2 seasons, both in his presence and in his absence. His career faded at the end, but outside of Sandy Koufax, outside of someone retiring in his prime, is that in any way unusual? Anyone remember how Kirk Gibson’s final year in a Dodgers uniform went? Manny Ramirez was mortal, unforgettably so. I only wish we had more of him, not less.